BENTON, Ark. – This July, a Walmart supply chain first is coming to Colton, California. A newly built, 340,000-square-foot high-tech consolidation centre will be the first in Walmart’s supply chain to receive, sort and ship freight. Automated technology will enable three times more volume to flow throughout the centre. The Walmart-owned centre, which will open in July with 150 full-time staff, will grow to employ more than 600 associates by 2021. Walmart continues to expand its portfolio of high-tech distribution centres. In October, Walmart announced that it had broken ground on a tech-enabled perishable grocery DC in Shafter, California. Consolidation centres receive LTL general merchandise items and consolidate into TL shipments for regional distribution centres. This allows Walmart’s 42 regional centres to focus on distributing products to stores. Automating the receiving upstream in the consolidation centre allows supply chain teams to group products based on how they are stocked, making unloading simpler. “We’re going to make the regional distribution centres more efficient,” said Geno Bell, senior director of the consolidation centre network. The new centre is also a warehouse. 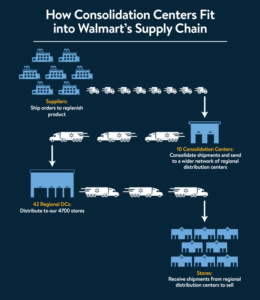 When it comes to reacting to unexpected events such as sudden changes in weather, having products separated and stored further upstream allows Walmart’s supply chain to react even faster to get the right products to the right places. For example, if there is an unexpected blizzard in the Northeast U.S., there will be a need for increased quantities of space heaters. If these extra space heaters are already in a regional centre in Minnesota, it’s more difficult to get them to Boston. The new centre in Colton will allow the retailer to react quickly and send space heaters to New England faster, maybe even before a storm hits.